Memorial Day. It is a bizarre holiday for a pacifist. My father proudly served in WWII and remained in the military reserves to retire a full bird Colonel. Which, to me was always about as twisted as could be since he was a very humble mild-mannered man. But, he 100% believed in 'his' war, in his country, and that what our politicians tell us is truth. In a nutshell - he would always drink the political Kool Aid. Yes, there was a chasm between us. But having said that, I hold nothing against my dad - I'm proud of his accomplishments and of all who have served the country. And time may tell if one side is right or wrong - we all have our beliefs and somehow, fighting over whether it is right to fight never seemed like something to pick up a gun and - well, fight over. The family wasn't always so smart! Every year on this day I pop in my car and drive to the cemetery west of town where nearly 300 full-sized flags line the roads - honoring the Oswego men (and I think at this point it is only men) who have served and passed away. There is a flag for my father and one for my grandfather. 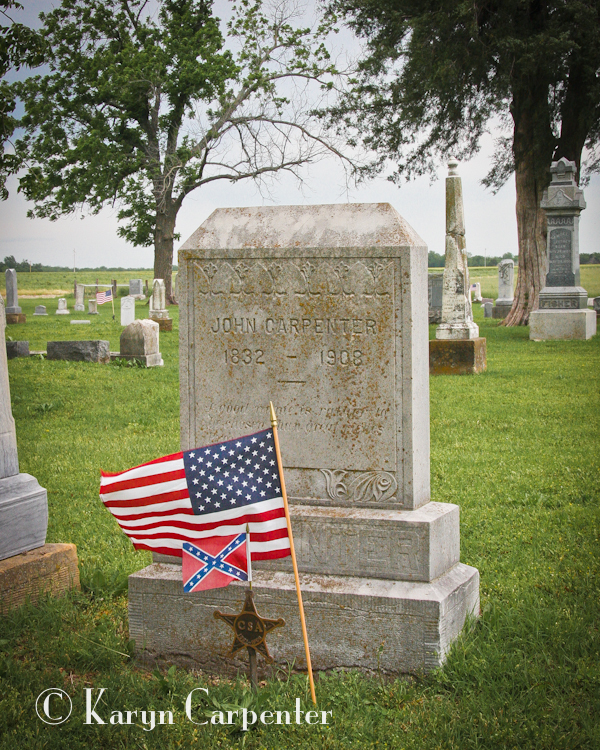 At their graves are smaller flags - not only for those who purchased the large flags but for everyone buried there who served. 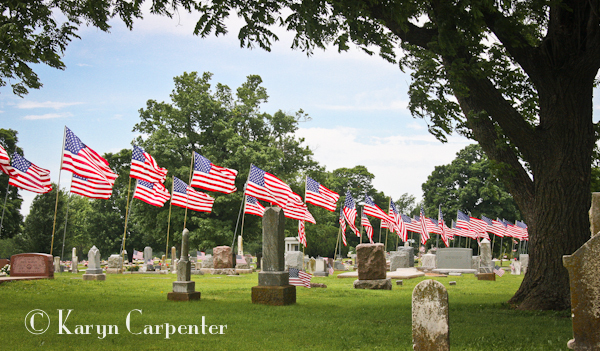 The cemetery is a riot of red, white and blue. 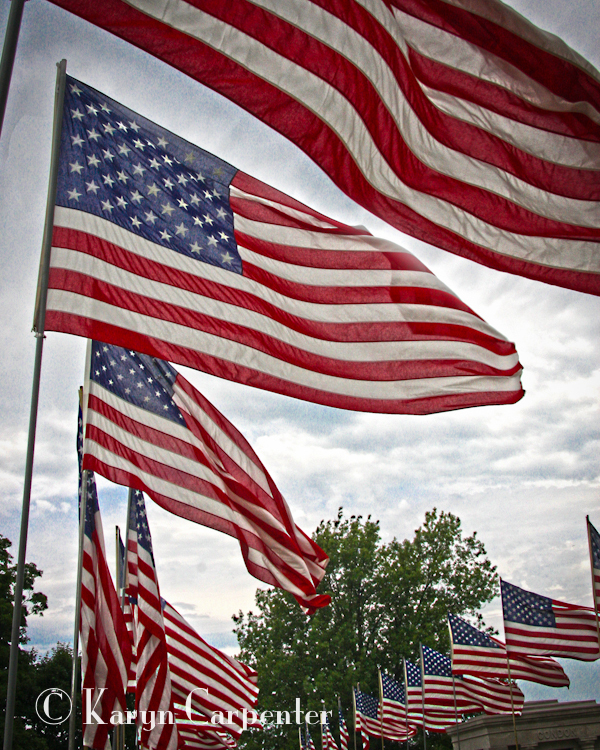 And, then, taking in the sight of all these flags and thinking about what that means - I come to the grave of John. Dirty laundry. REAL dirty. But, it is waving out there for all to see. John Carpenter - 1832 - 1908. Probably the only Confederate flag flown at the cemetery belongs to my relative. Great great grandfather, perhaps? I'm tempted to tear the flag down - perhaps burn it in its place - but out of respect for 'ole John I leave it be. I think the story goes that he wasn't just a Confederate, but a body guard to Jeff Davis. sigh……. So, in celebration of the day - I share with you the flags - even the dirty little secret one.